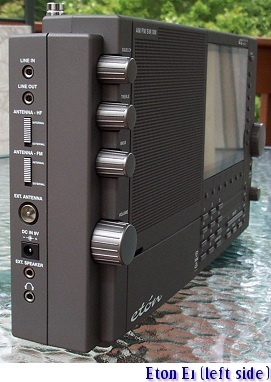 August 2005…the date the long awaited, much anticipated Eton E1 receiver finally made it to market. Why is this particular product introduction so noteworthy? Well for one thing we’ve waited 10 years for it. Originally unveiled in prototype form at the Consumer Electronics Show in Chicago in 1996 as the Grundig Satellit 900, the E1 has followed a long road from those first mockup models to commercial realization. Originally sidelined because a critical circuit component was discontinued (at least that’s one of the stories), the never-to-be Satellit 900 was promised time and time again with new delivery dates which came and went with no Satellit 900 ever marketed. There’s another reason as well…the Eton E1, as a replacement for the recently discontinued, somewhat controversial Grundig Satellit 800, marks the end of the famous Grundig Satellit name plate and is Eton’s statement that they are indeed the corporate entity behind this new radio. (The Satellit 800 is controversial for a few reasons. First, it was made to resemble its predecessor, Satellit 650, but internally is a completely different design. This really offended lovers of the 650 series. Secondly, although its ultimate performance is considered to be excellent, its quality control was horrendous. A high percentage of 800′s had to serviced by R.L. Drake before they would perform to specifications. However, once you had a “good one”, either through Drake’s excellent service or just by luck of the draw, you had a radio which is astounding anywhere near it’s price point). Through a somewhat secretive collaboration with R.L. Drake and XM Satellite radio the E1 is a bold and fresh new contender in the World Band portable radio market. The E1 heads up a line of radios which also include the smaller E10 and E100 portables. 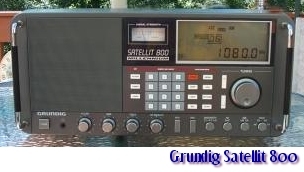 And even though this is no longer referred to as a “Grundig Satellit” radio, it is indeed “XM Satellite Ready.” Satellite Ready is a new, official XM standard and means that the radio that will provide XM when attached to an optional, external XM antenna. The E-1 is in many ways a departure from those classic Grundigs. Although the Satellit’s could all be classified as portables because they contain built-in antennas and run on battery or AC power, they were very large heavy radios. 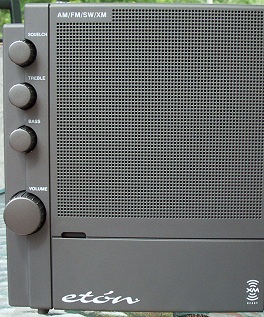 There were a few smaller Grundig Satellit models, the most recent of which, the Satellit 700, was a prime example of quality and features and is highly regarded by Grundig aficionados. The E-1 is a lap-sized portable at approximately 13” x 7” ½ x 3”. 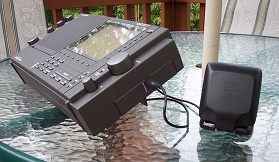 It is the largest World Band portable available right now, somewhat larger than the Sony 2010 or SW77 portables but small compared with the Satellit 800 which is is over 20 3/8” x 10 1/4 x 8”. In fact Eton’s own literature refers to the E-1 as a Porta-Top…a cross between a portable and a tabletop set, and for many reasons that is appropriate as we shall see. For all these reasons the radio industry is anxious to know how the new E1 compares with the Satellit 800, the famous Sony 2010, arguably one of the most successful and highly respected portable SW receivers of all time, and the Sony SW77, the most recently discontinued top of the line Sony portable. Will it be a new benchmark world band receiver that other radios will be compared with or will it be just ok with lots of bells and whistles but little substance for the serious radio enthusiast? Finally, what new features does the E1 offer, and how does the XM function work in the scheme of a World Band receiver? I was as anxious as anyone to find all I could about the E1 for myself and I was fortunate to receive one from the first shipment for evaluation, so let’s get to it! Upon removing the E1 from the packaging I was immediately taken with its apparent quality. This is a solid feeling set…nothing flimsy about it except possibly the rod antenna. It swivels about loosely enough that if the radio is tilted back on its stand you have to keep the antenna vertical or it will swivel over and flop down onto the table. This is not a problem when the radio is standing vertically and it is literally the only mechanical weakness I would like to see Eton address. Quality control seems to be superb for a new model introduction – it is typical for new world band radios to arrive with design flaws which are only ironed out after the first production runs. So far this has not been the case with the E1. Of the first shipment of units I have heard of only 1 sample defect so far and that is amazing in itself. I did experience a small problem with my E1…it was not packed properly by the seller and arrived with its outer box almost totally destroyed. Inside the box the styrofoam was broken, also indicating that the unit had been abused in shipment. Sure enough the radio was dead when I first powered it on – was I the unlucky recipient of one of the first defective E1′s? I opened the radio up (very simple – 4 screws and the front and rear halves separate…see pictures). I was relieved to see several connectors which weren’t fully seated. I pushed them all firmly back into place and the radio was now operational. Whew!!! Well at least I got to see the insides…nice clean layout, fully connectorized, and the XM module looks like it could easily be swapped out if Eton decides to offer a different module in the future, say for Sirius Satellite or possibly even DRM. At least their options will be open. The E1 is a very full-featured AM/FM/SW/XM-ready radio. In addition to the traditional WorldBand features it has a few unique ones which I will detail as I go through the discussion. Some examples include 1700 non-volatile station memories (meaning they will not get lost if power is removed or if the radio needs to be “reset”), 3 IF bandwidths of 7, 4 and 2.3 KHz, automatic or manual AGC speed selection, synchronous detection that functions in double sideband mode in addition to the traditional upper and lower sideband modes, passband tuning, three tuning speeds and 3 frequency readout resolutions in AM and SW modes, automatic time setting, dual timers, a huge LCD display, an unusually intuitive control interface with “soft” keys which change function depending upon mode of operation, a switchable antenna pre-amplifier available in all modes except XM, a clever squelch control for all modes except XM, auto battery backup when AC power fails, three level illumination (Eton says 4 levels but one level is “Off”)…I could go on and on because this radio is so rich with features the list seems almost endless. The E1 is assembled in India and sports Eton’s new rubberized finish that has tremendous tactile appeal. All of the controls feel solid and sturdy and the radio absolutely exudes quality…it is a joy to hold and operate. Only the initial batch of E1′s had been shipped as of this writing…my radio is serial number 186, but initial quality has been outstanding. Eton may have taken their time bringing the E1 to market, but it appears the wait has been well worth it. The Eton E1 retails for $500 in the U.S. (XM antenna a $50 option). I have put the E1 through exhaustive comparisons with several reference receivers and those results will appear throughout this article. The E1 is unusually versatile in the way it stores and manages your station presets. It allows up to 1700 memories to be stored along with all the associated settings for each preset. There are 500 standard memories which can be set up in pages of up to10 entries per page. They each have alpha-numeric labeling capability for easy retrieval. There are also 1200 Country pages pre-loaded with countries from A to Z, however, no frequencies are entered as they would mostly be out of date or not relevant to one’s location. It is left to the user to save his own frequencies on any of these pages, which can also be renamed or deleted as one sees fit. But the real fun starts once you have programmed some stations into the memories, because it is so easy to access them. You can flip through the pages with lightning speed, and within each page you can either scan all the frequencies manually or use the advanced scanning options to find the best ones for you, Here is where the unique squelch control comes in. As with any squelch control you simply advance it until background noise is muted; thereafter any signal above that point will get through. In the E1, as you increase the squelch setting, a small curser underneath the signal level display indicates squelch level relative to received signal strength. If the signal bar travels further to the right than the squelch bar, the audio is unmuted. This same threshold is also the “Seek Stop level”…in seek mode, stations above the Squelch threshold will be found. This, along with the fact that you can seek through any Memory page, Country page, or band you select makes the E1′s seek control unusually useful. For example, you select a memory page, say Voice Of Russia, and within that page the Seek button will stop only on active channels. You can also “tag” favorite stations, then access them quickly with the E1′s “T. Scan” feature. It’s very, very nice and a fast way to find things to listen to. Of all the digitally-tuned radios I own this is by far the most flexible, easy to use system I’ve encountered. http://www.xmradio.com/ . Suffice it to say that while it may not be for everyone, it does offer a wealth of listening options, from dedicated “decade” channels, such as “The 40′s on 4″, the “50′s on 5″ etc, plus many music format channels, talk channels, BBC World service and even Old Time Radio on channel 164. One caveat: do not plan to use the E1 as a portable XM radio…battery drain in XM mode is way too high for that. Depending on volume level battery life can be as short as 3 or 4 hours before the radio quits due to low battery voltage when in XM mode. (It will still play for days and weeks in other modes which require far less power). For XM, plan on using the supplied AC Adapter. That requirement, as well as the accessory antenna virtually mandate that for XM mode the E1 be left in a fixed position. Of course, you can also use the Stereo Line Out or Stereo Headphone jack to enjoy XM music in full fidelity stereo as well. The sound quality of XM is much better than the XM specifications would suggest. (I am referring to XM’s specs, not the E1′s). At a maximum bit rate of 128 KBPs, it would be considered to be “near CD” quality in mp3 circles. However there is generally much less audio processing on the XM music channels so the sound is much more like listening to a CD than the same music would be on FM, where broadcasters manipulate their signals to make them as loud and punchy as possible. You will find, though, that some of the talk channels use a far lower bit rate which can cause the human voice to have an odd, metallic quality. XM uses different bit rates on various channels in order to conserve overall bandwidth for all their channels combines, so don’t expect most of the talk channels to be full fidelity…they are more comparable to AM sound quality, especially if you are listening on external speakers or headphones. Not bad, but not the full fidelity of the music channels. Antenna positioning for XM is relatively non-critical in my wood frame home in the Northeast US. Although you are instructed to aim the XM antenna in a South facing window I found good signal in some rooms with the antenna sitting on a desk or table not even aimed at a window. Obviously some signal was able to penetrate right through the roof or walls. In other rooms with no South facing windows, I still got good reception with little problem. One you find a spot where the XM antenna works it seems solid day after day…the 20 foot cord is more than adequate in my situation, but extensions are available. The E1 is a top-of-the-line radio and in most ways it delivers the kind of top-of-the-line performance we have been hoping for. However it is not without a few compromises. As I mentioned earlier the big question in many people’s minds is “How does it compare with its predecessor, the Grundig Satellit 800 and the legendary Sony 2010 and SW77″. I am happy to say that although each of these models has its strengths and weaknesses (after all, no radio is perfect), the E1′s overall mix of features and performance at least equals them when taken as a total package, and the E1 does break new ground in several important areas. Here’s what I found. However, that doesn’t mean the 2010 always provided the best overall shortwave reception. For one thing, the excellent synchronous detection on both the Grundig and the Eton held lock far below the level the 2010 could, meaning that listenability was often better on either of them than on the Sony. I noted that both the Grundig and the Eton had a slight trace of synthesizer noise which set the background noise level on some frequencies. This is fairly typical of synthesized receivers and again, affected only signals at the limits of detectability, but the 2010 was completely free of this noise by comparison. Next I tested crowded bands at night for the ability to find weak signals buried in the noise caused by many other signals fighting to cover them up. This test reveals not only basic selectivity but also the dynamic range of the front end – the ability to receive weak signals in the presence of stronger ones, not necessarily right next to them in frequency. This so-called desensitization is the result of many areas of performance such as front end dynamic range, image rejection, blocking and basic selectivity. Here the results changed. The SW77 actually had to be switched to Local for some of these tests…it revealed some symptoms of overload even on its whip antenna at night. It was the only radio that overlaid an image of another signal over a relatively strong Radio Havana Cuba on 6000 MHz…the interference disappeared if I used the Local switch or lowered the whip antenna partway The 2010 didn’t do badly by comparison, but the E1 and 800 revealed many signals with much less background interference or noise and the audio seemed to emerge against a “cleaner” background making them more listenable. Also the 2010′s wide bandwidth is so wide that it often had to be set to narrow, which causes the sound to be very muffled…not enjoyable for a program listener, although useful for a dxer. The E1 and 800 have 3 bandwidths and only in the worst cases did I have to resort to the medium bandwidth setting which sounds quite reasonable compared with the 2010′s narrow setting. And while you can often use the 2010′s sync to eliminate some interference that won’t help if there is an interfering signal on both sides of the desired one. AM Sensitivity with batteries and internal antennas: The lack of a ferrite rod antenna for AM in the E1 turns out to be a hindrance and is, to me, the most important design compromise Eton chose to make. For weak signal AM sensitivity the E1 does fairly well, but the 2010 is more sensitive in a side by side comparison. The 800 was very close to the 2010 as well while the SW77 was clearly the least sensitive on AM, delivering noticeably noisier AM reception on weak signals than the others. But when there is local electrical interference to contend with (the all-too familiar “buzz”) all the ferrite rod-equipped radios could be rotated so as to null the noise but I was not able to null it with the E1′s whip. At night with many strong signals the whip fares much better and works fine for general program listening even on distant skywave signals. So the bottom line: the E1′s whip performs surprisingly well on AM with good sensitivity until there is electrical interference, then it becomes the worst of the group by far. *Note: The E1 is noticeably more sensitive on AM than the SW77 but if there is any local interference the E1 is completely swamped by it whereas the SW77 can be rotated to null the noise. Again this is because the E1′s whip antenna is non-directional on AM. 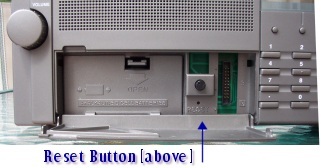 External Antennas: The E1 uses a PAL Antenna input jack. This is not a very common jack here in the US, but it is rugged for its size, and is decidedly better than the typical mini jacks found on most portable radios. The owner’s manual states that a PAL connector is provided but my E1 did not come with one. You will need an adapter to connect most antennas to the E1′s PAL antenna connector. You can use the Radio Shack Catalog #278-265 or Universal’s #1156 PAL Female to F Female adapters. I also needed an RCA Female adapter for one of my antennas. I further recommend a right angle F connector be used in addition to make your installation neater and to reduce strain on the jack and cable. Unlike the Satellit 800 the E1 sports only a low impedance antenna input suitable for 50 to 75 ohm antennas. If you wish to use a high impedance antenna, such as a random wire, you can either clip it to the whip or use a balun to convert it to low impedance. Either method should work…the low impedance solution has the added benefits of more consistent reception across different frequencies and less local interference if that is an issue in your area. I verified that the E1 works extremely well with several external antennas I had available. The Justice/C.Crane Twin Coil Ferrite works beautifully on AM with a direct connection to the E1. I also tried a Select-A-Tenna Model M (the version with a jack which can be used for input or output), a 70 foot random wire and a Wellbrook ALA330S. On AM the Twin Coil eliminates all the drawbacks of the whip. You now have a rotatable ferrite rod antenna, extreme sensitivity and AM reception that’s about as good as it gets without a much more sophisticated antenna. The Wellbrook provided excellent AM and SW reception far exceeding with I could her clearly on the whip antenna. The comparisons among the 4 radios were similar to the nighttime whip results above but were even more obvious. More signals and stronger ones were being fed to the radios putting the dynamic range of their front ends to the test once again. Comparing the 800 and the E1 with these antennas it was difficult to detect many meaningful differences in reception on AM or SW. Here both the E1 and the 800 were able to resolve several tough signals that were either non-existent on the Sony’s or were severely attenuated by comparison.The E1 versus 800 revealed seemingly identical noise floors, sensitivity and selectivity. I used the three filter settings on each radio to isolate a weak dx signal on 1350 adjacent to a relatively strong local on 1360. In Wide mode both the E1 and SAT 800 had loud splatter. In their medium settings they were very close…each allowed just a small amount of splatter through. Small differences in fine tuning swamped any perceivable differences in their ability to separate them. And each radio was able to reveal the weak signal in full fidelity in it’s wide mode with the sync on lsb. The SW77 and 2010, with only two bandwidths mandated the use of sync to clear up the splatter unless I wanted to listen in their extremely muffled narrow bandwidth settings. But when I tried to separate a very weak SW signal near a much stronger signal the 2010 fared less well than the E1 or the 800. Each of those radios was able to render the weaker signal clearly using sync and their medium bandwidth setting, but the 2010′s wide was too wide and although the narrow mode separated the signal out, it was too muffled to enjoy. Again, the 2010 and SW77 would do it for a dx-er, but a program listener will recover a better signal with the E1 or the 800. 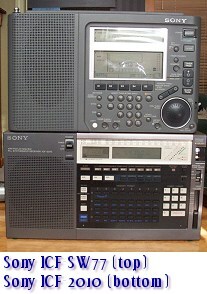 I also noted that overall best reception with the Sony’s required the use of the Local setting of the RF Gain…in the usual DX position many signals seem suppressed although there was no obvious overload interference…it was clear that the front ends were not as comfortable with the higher signal levels as the E1 or the 800. Some signals were better in DX but many were not. The 2010 did reveal a few signals I couldn’t get on the SW77 which had to remain on “Local” all the time. Again, this form of overload or poor blocking performance isn’t readily apparent except on a side by side comparison. It’s not the gross kind of overload we know by that shimmering mess that covers everything up. The E1 and 800 really demonstrated the wide dynamic ranges of their front ends and seemed to behave amazingly similarly. Also note the SW77 is the only radio in this group which does not disconnect the internal AM ferrite antenna when an external antenna is plugged into the antenna jack…a limitation for those who use external antennas for AM. By the way, you will not be able to use any antennas that operate via inductive coupling with the E1…they require the radio be equipped with a ferrite rod to radiate their signal into. However, I used several antennas with a direct connection with great results. The C. Crane Twin Coil Ferrite antenna works extremely well with the E1 in this mode and makes the E1 a very “hot” am dx portable, giving not only extreme sensitivity but also directionality when needed. The E1′s sync is phenomenal, holding lock right down to virtually zero signal just like the 800. In fact the E1 and 800 show similar sync lock behavior even to the way they recover after signal loss or retuning. The 2010 by comparison needs more signal to lock in. A welcome new feature, the E1 is the first radio I have seen with the option of double sideband sync and that is the preferred sync mode unless you have to use upper or lower sideband sync to eliminate interference as it generally sounds best. An example: On AM stations using IBOC, sync generally causes a rushing noise in the background rendering it useless…but there is no such noise in the E1′s double sideband mode. However, each radio had instances where its sync behavior caused quirks not present on the others. For example the E1 won’t do upper or lower sync mode on my local AM without causing a whine in the background while neither the 800 nor the two Sony’s had that problem. The E1′s sync was fine on this same station in double sideband mode however. Yet on other signals the E1′s sync was noticeable nicer sounding than the SAT 800 or Sony’s which changed the basic sound quality of the stations more, making it either thinner or duller, usually with the two sidebands noticeably different. I am talking about very fine distinctions here and overall I would say the E1 and SAT 800 sync circuits were as close as they could be with the Sony’s clearly less able to hold lock on weak signals. The E1 also offers the option to engage an enhanced sync mode which gives an additional 30 db of sideband rejection which can be a tremendous asset when the interfering signal is nearby and over powering. Sound quality is highly subjective but there are still many objective things one can say about the sound of the E1. For its size the sound is first rate. 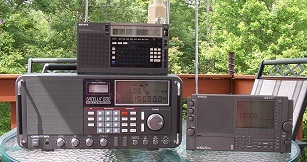 There are some older non shortwave portables with a fuller sound, but there are no current models and no world band portables which sound as good to me. The E1 is rich and full sounding, with good tone control action. The three bandwidths are a big help, allowing a wide frequency response on good AM and SW signals but still allowing you to narrow the bandwidth when needed. By comparison to the Satellit 800, it didn’t surprise me that the much larger 800 sounds like a bigger radio…it can fill a room more convincingly, has better depth and overall a “bigger” sound. The Sony 2010 is considered to sound “thin” by many users. I prefer to think of its sound as crisp, and indeed, intelligibility is one of the hallmarks of the 2010. Clearly though the E1 is a better sounding radio for general program listening with a pleasing tonal balance and good tone controls and audio power. The SW77 has the least good sound here…it’s extremely “midrangy” by comparison, with little bass or treble, even though it has individual bass and treble controls. It manages to sound both muffled and thin at the same time on AM & SW. The E1 exhibits a very slight amount of synthesizer noise on AM and SW which is only audible in some conditions of extremely faint signals and only on some frequencies. Sometimes the noise, which sounds like interference from a small motor such as a hand mixer was the factor which set the noise floor on the E1. It was very well suppressed so that it wouldn’t really be a limiting factor on any listenable signal, but if you’re scanning around you will note that the noise floor contains that electrical hash on some frequencies. Other radios could pick up this hash from the E1 from several inches away. Interestingly, using a ground connection, an external antenna or the AC Power Adapter (which at least in the U.S. is three-pronged and grounds the E1′s chassis directly) totally eliminates the synthesizer noise just as it does for the SAT 800. The characteristics of the synthesizer noise and the facts that it changes from frequency to frequency and that grounding stops it seem amazingly identical on the E1 and 800. Again, many will read this and be alarmed at the mere mention of synthesizer noise. Let me re-iterate…the synthesizer noise is way down in the noise and won’t be a limiting factor unless you are hunting the faintest of dx signals. It is hard to hear in many cases and can also be easily dealt with. I also noticed that the E1′s S-Meter matches the 800′s S-Meter when E1 DX mode is Off…engaging DX boosts signal levels 10 db. However, with DX on the E1 and 800 showed virtually identical weak signal sensitivity, so evidently the two meters are not calibrated similarly. (Incidentally, the S meter on my particular 800 was calibrated by R.L. Drake at my request). This point shouldn’t be taken too seriously…it is widely accepted that no two S-meters on different models of radio track similarly and they are best used for relative indications of signal strength and for antenna aiming purposes. I do prefer the mechanical S-meter of the 800…any mechanical meter will show finer variations than a digital bar graph display, but I am picking nits here. In many cases, turning DX on and off caused only a slight difference in perceived signal quality even though the meter jumped 10 db, indicating that the signal-to-noise ratios was being determined ahead of that gain stage. As I always say, no radio is perfect, and there are indeed a few complaints one could have about the E1. No Ferrite rod antenna – It would dramatically improve the E1′s AM performance. Why does Eton’s top of the line radio lack one? No Handle – although neither Sony has a handle either, only a carrying strap which I’ve never liked. No RDS – not a biggie for me but many enthusiasts feel it should have been included. Flimsy whip antenna – One could wish for a longer, more robust antenna on such an expensive portable – one that could hold any position without swiveling down and one which approached the length of the Grundig Satellit antennas. High Battery Drain In XM Mode: Battery life on AM/FM/SW modes is moderate, but in XM mode the drain is approximately doubled. In fact Eton recommends using the AC Adapter in XM mode. Also note the less expensive E10 contains a built-in charger…that would have been a natural for the E1. Many enthusiasts are waiting to hear whether or not The E1 “blows away” the Satellit 800, or vice versa, or if it diminishes the “legend” status of the Sony 2010. Some early owners have already made such claims. The reality is a bit more mundane than that. The fact is that these are all excellent radios, so the possibility that one could “blow the other one away” is unlikely. Indeed, modern radios have so far pushed the envelope of what is possible that only incremental improvements are likely. Such is the case here. So if you’re looking for me to say the E1 trashes all the competition you are going to be disappointed. The E1 is in many ways a remarkable product. Comparing it with the Satellit 800 I found them to be extremely similar in technical performance. This is good news for owners of both models because in World Band portables, these are about as good as it gets at this price. I find the two radios to be uniquely suited for slightly different applications, although each is flexible enough to be your only radio. 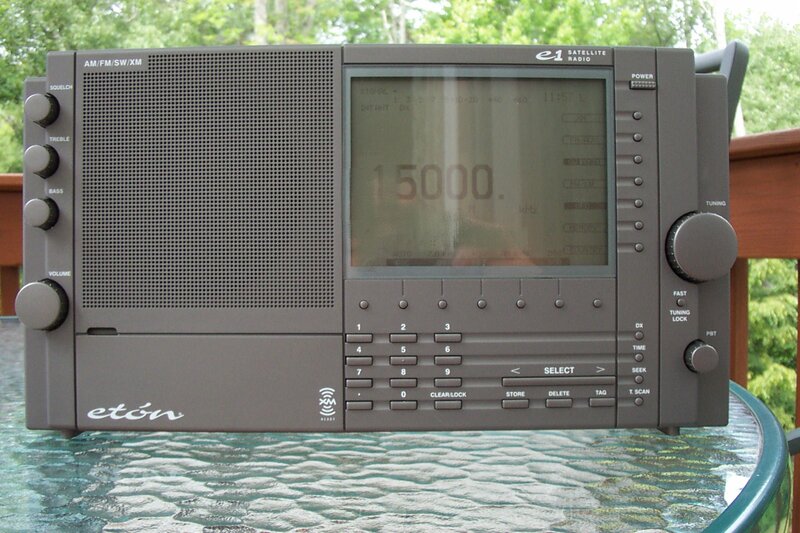 The Satellit 800 is 5 times the size of the E1 and seems best suited as a desktop radio. It’s sheer size and large well-spaced controls make it easy to use and it fills a room with sound more convincingly than the much smaller E1. It also features a built-in stereo amplifier with stereo speaker outputs – not just stereo line outs – plus heavy duty SO-239/PL 259 antenna connections and switchable high and low impedance antenna inputs. 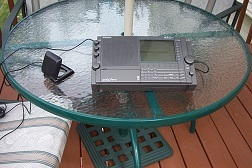 The E1 is well suited to portable use as an AM/FM/SW receiver, but AM won’t be its strong suit due to the whip antenna. If you are going to use XM (and there are a lot of good reasons to consider it) the E1 virtually requires AC power. It also offers an amazing array of memory and tuning features which can greatly enhance the ‘fun factor” of this radio. The E1 is a genuine joy to use. For now my Satellit 800 remains in my den and the E1 is my new nightstand radio. There it gets AC Power to feed the XM, is connected to an external AM antenna and its stereo line outs are connected to a stereo sound system for times when I want to crank the XM. But I can still disconnect it to carry around the house as a portable and it works well that way too as long as I am not going to use XM. The Sony 2010 can still claim to be the most sensitive SW portable anywhere near this size category, and I won’t be getting rid of my 2010 any time soon. But even though it is a tad more sensitive off the whip, the E1′s enhanced dynamic range and other rf capabilities, it’s superior sync circuit and it’s excellent SSB performance make most listenable signals sound better than on the Sony. The SW77 is the least capable in this group. It’s once novel “Page Tuning” feature (which I still like) simply doesn’t compare with the flexibility and scope of the E1′s memory system. In total the E1 is a huge success and Eton is to be congratulated for giving us what stands as the current “Leader Of The Pack” among World Band portable radios. At this moment it’s the best World Band portable on the market and I highly recommend it.